We’re your home and office cleaning EXPERTS! If you’re looking to improve the cleanliness of your office or facility, or if you’re just thinking of hiring a cleaning service, we hope you’ll give us a call. We do commercial cleaning, construction or move in-move out cleaning, and daily, weekly, bi-weekly or special event cleaning. I always treat people fairly, with respect and honesty in ALL situations. I always do what I say I will do and by when I say I will do it. I believe in giving people more than what they expect to pay for. I believe if a customer objects to anything, repair it, replace it or refund it immediately and without question. I believe that now – more than ever before – there is a need to restore these “old fashioned” values, especially in today’s uncertain economy. 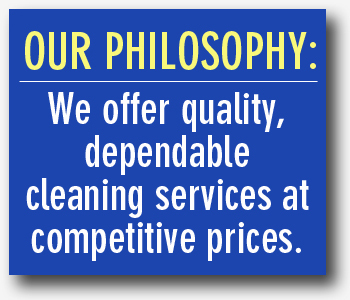 Call us today to discuss any of your cleaning needs. You can reach me at 330-592-9860. I am confident you’ll find that we offer outstanding value. I look forward to talking with you! We Want to Clean for YOU! Call us today at 330-592-9860 to discuss your cleaning needs. There is never an obligation and no pressure. We can probably get the information we need to give you an estimate with a single phone call. It's easy, so call today!